As part of Unitec's contribution to New Zealand Music Month there will be a presentation on Māori music at the Waitakere campus. This will take place at 11.00am, Monday 28 May, at Level 2, Waitakere Central Library. Mereana Taungapeau from the Alexander Turnbull Library will present images from the Alexander Turnbull Archives, including photos of Māori performers from the last 75+ years. Wednesday 30 May, Thursday 31 May and Friday 1 June, to refurbish the area. There will be no access to Level 1 of the Library for public or Unitec staff and students, unless the work is completed ahead of schedule. Unitec staff and students can access Level 3 Unitec designated space and Level 2 Non-Fiction Collection, via the airbridge from Building 510. Access via the airbridge is ONLY for Unitec patrons during the refurbishment. 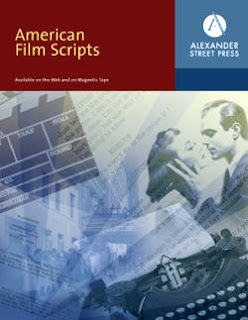 American Film Scripts Online contains 1,009 scripts by 1,062 writers together with detailed, fielded information on the scenes, characters and people related to the scripts. Most of the scripts are accompanied by PDF versions of the original script. In addition, the database includes facsimilie images for more than 500 of these screenplays. Most of the scripts have never been published before, and nowhere else are they available online. American Film Scripts Online uses PhiloLogic software, developed at the University of Chicago, to enable in-depth browsing and searching of both the bibliographic and the full-text elements within the database.